Milwaukee Road Poems, David Dale, UM Thesis, 1991. Robert Lynn, "Death by Electrocution? The Chicago, Milwaukee, Saint Paul and Pacific Railroad's Choice of Electrical Motors over Steam Engines in Montana, 1914-1974," Master's Thesis, University of Montana, 2004. Marston Curtis, "Electrification Work of the Chicago, Milwaukee & St. Paul Ry, From Harlowton, Montana to Avery, Idaho," a Thesis, the Armour Institute of Technology, Chicago, Illinois, 1916. Complete Index for Milwaukee Road Media Monitor [Milt Clark Collection]. Media Monitor, July 29, 1983 "CNW Bids For Milwaukees Core WSJ"
"Instructions for Substation Operation," August, 1921, CM&St.P. (Jonathan Bradley Collection). Sample Cost Study, Wheat Program, Spokane to Seattle, Developing Cost Profile Comparisons, GN, MILW, SP&S Alternatives Permits a cost analysis of operating various sized dedicated grain trains over the three alternative routes, with interactive features for changing motive power, train sizes, fuel, cost, helpers, interest rates, and projected locomotive and car fleet sizes necessary over each route, estimating overall costs of operation and profitability with user determined rates. In Economic Studies. Milwaukee Road Cars and Tons by Commodity, 1977, Lines West of Miles City. In Economic Studies. 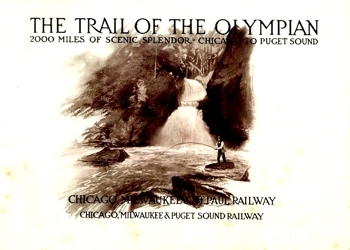 Trackage Rights Agreement, Columbia & Puget Sound Ry and the St. Paul, May 21, 1906, Maple Valley to Argo, WA. "Joint Line Agreement," St. Paul and the Oregon and Washington RR Co., January 1, 1909, Tacoma to Black River, WA. 1898 "Maps for Ready Reference"
Letter, H.R. Williams to Kenneth Ross, re: Dam and Reservoir site on the Missoula River, July 14, 1908. Letter, H.R. Williams to Kenneth Ross, re: Milwaukee purchasing Anaconda Company's Flowage Rights, July 13, 1908. General Electric Review, November, 1914, "Special Number on Electric Traction." H.M. Hobart, "Electrical Machinery Tests and Specifications," General Electric Review, November, 1917 -- how the MG sets were rated. Letter, Dugan to Quinn, 1/24/1966, profitability of the Port Townsend RR. R. W. Richards, "The Central Part of the Bull Mountain Coal Field, Montana," Contributions to Economic Geology, 1908, US Geological Survey, US Gov. Printing Office, 1910. Maurice Campbell, "Contributions to Economic Geology, 1908," US Geological Survey [Full Volume]. 2003 Annual Report to Securities and Exchange Commission, Heartland Partners, LP. Describes the disposition of the last of Milwaukee Land Company's holdings. Billings Daily Gazette, "Two New Towns for Montana," July 24, 1910 -- Ubet and Piedmont. 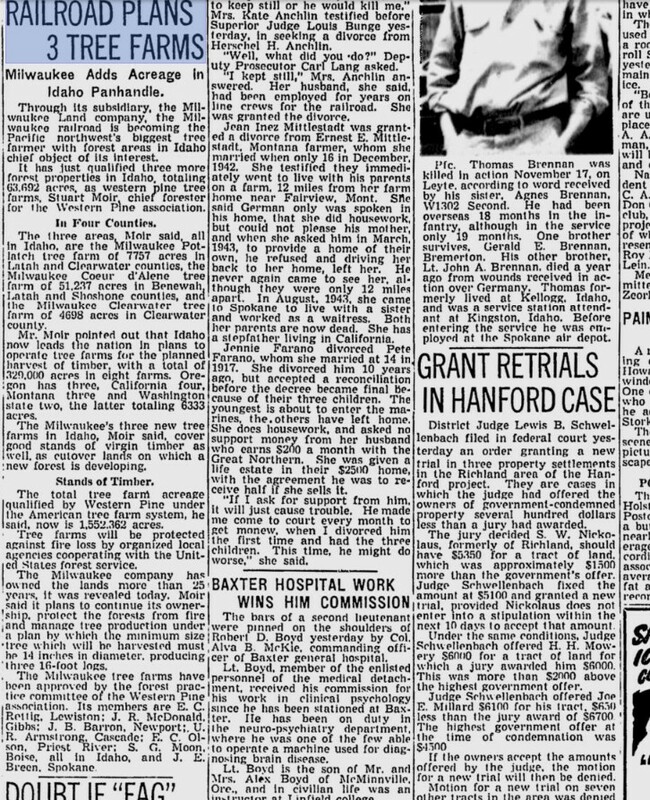 The Chehalis Bee-Nugget, "To Build Mill Near Salkum," March 2, 1923 Mill site bought from Milwaukee Land Co.
1929 "Yesterday, Today and Tomorrow"
US Senate, "Commercial Relations of the United States with Foreign Countries," 1909, p. 28 Tacoma Maru to dock August 1. Electric Railway Journal, "Heavy Electric Traction Discussion," May 22, 1915. Hill Letterbook, James J. Hill Archives, Series P, 1877-1916, 1898 September 26. Hill to Marcus Daly. 1897, June 26, "Dear Mr. Morgan, I received your letter on this date saying that Mr. Earling cannot accept the position as president of the Northern Pacific Railway." p. 201. 1897, July 2. "Dear Mr. Earling, I told Mr. Morgan I hardly considered it possible for you to leave your present place." p. 208. 1898, August 4, Letter to Gaspard Farrar, London Engineer. 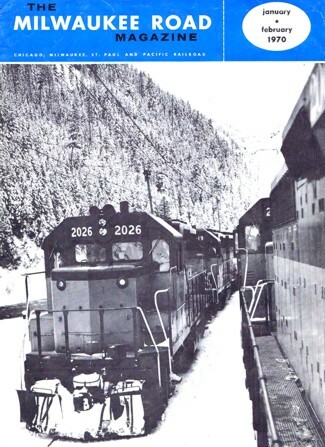 The GN long haul is 221 miles, the Canadian Pacific has 376 miles. 1989 May 14, to A.L. Mohler, President, OR&N. 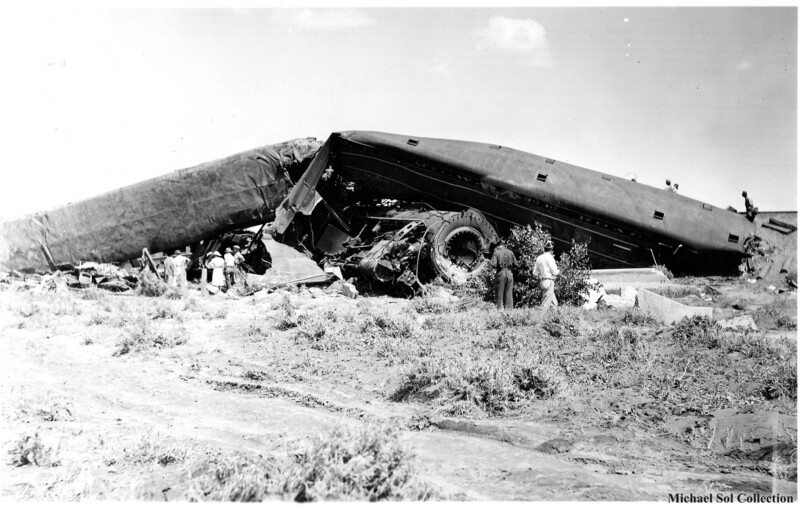 "I had a very satisfactory interview with Mr. Schiff, who practically represents the Union Pacific." 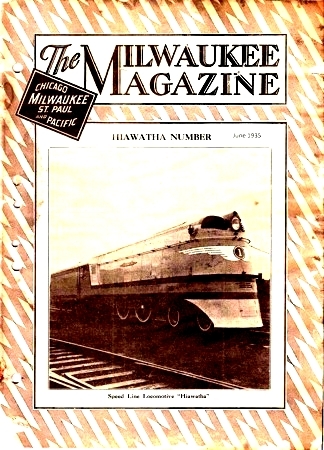 "Hudson/Baltic" in storage at Milwaukee, Wisc, 1950, "They were using parts off this one to repair other 4-6-4's"
The Pacific Review, "Impressions of a Hobo," September, 1921. 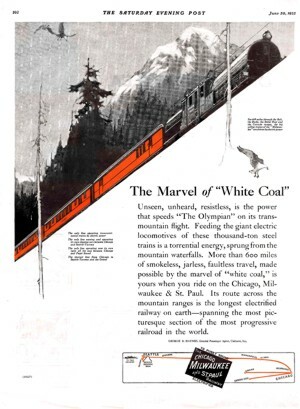 Electric Traction, "Electrification of Steam Roads Will Save 122 Million Tons of Coal," July, 1920. Address by Frank Kerr, MPC, to NELA. A.H. Armstrong, "The Future of Our Railways," May, 1920, Paper presented at NELA convention. 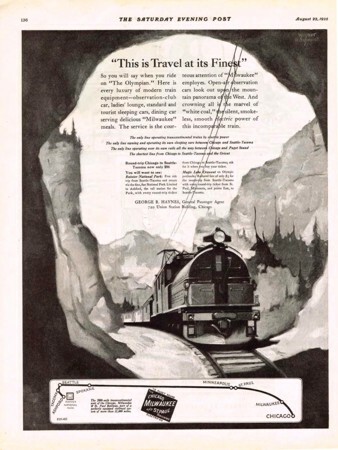 Electric Trunk Line Age, "The Cascade Tunnel," January, 1908, p. 39. 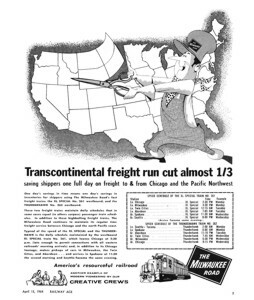 Financial World, "Northwest Rails Should have Good Year," July 11, 1952, Compared to the NP/GN oil booms, "the timber holdings of the Milwaukee Land Company may prove more valuable in the long run." 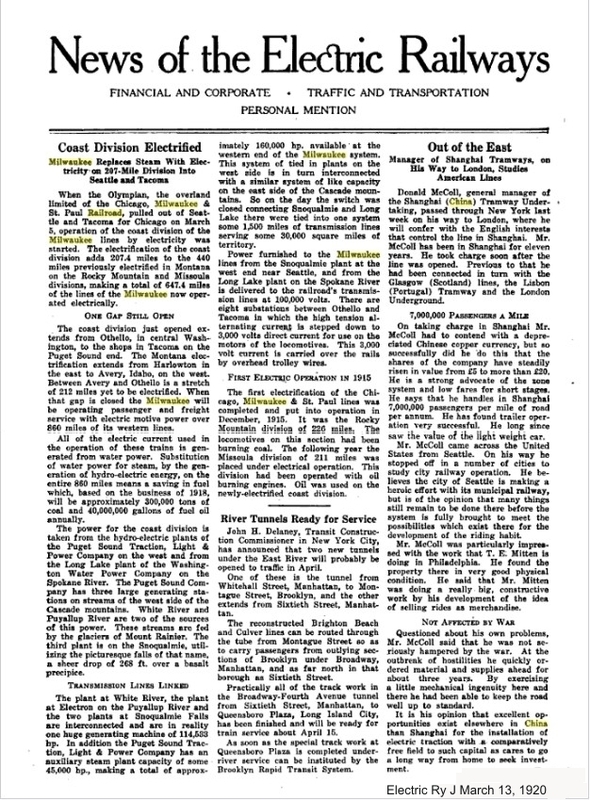 Aerial Age, "Summary of Congressional Investigation," March 1, 1919, "Spruce Railroad" and John D. Ryan. W.T. Prosser, "Electricity Doubles Tunnel Capacity," The Technical World, December, 1909 -- The interest of the Chicago, Milwaukee & St. Paul officials in developing water power along their 1,200 mile extension to Puget Sound undoubtedly stimulated James J. Hill to completion of long considered plans for the Great Northern's utilization of [water power]. "Railroad Steamship Contracts," Traffic World, November 12, 1921. Language of Milwaukee contract. "The Railroad- Steamship Contracts," Traffic World, December 10, 1921, MILW and GN unwilling to give up contracts. "Railroad Steamship Contracts," Traffic World, January 7, 1922. MILW and GN not cancelling. Hiawatha Trail Panel: "St. Paul Pass Tunnel"
Hiawatha Trail Panel: "Rough & Tumble Camps"
Hiawatha Trail Panel: "Race to the Middle"
Hiawatha Trail Panel: "No One's Fault"
Kristi Pihl, "Franklin County Places White Bluffs Marker," Tri-city Herald, May 18, 2011. Rob McKenna, "Battle is Putting Politics over People," Hanford News, July 128, 2010. Located at White Bluffs page. The Ticker, "Railway Electrification," May 1908,1:2. "Builder of the Great Northern Worked for Thirty Years Without a Salary," New York Times, September 16, 1912. Praise from Roswell Miller. Victor Appleton. "Tom Swift and his Electric Locomotive, or, Two Miles a Minute on the Rails," 1922. John Moody, The Masters of Capital, 1912, Notes. "Miss Rockefeller Married to Mr. Dodge," New York Times, April 19, 1907. "Frenzied Finance," by Thomas H. Lawson, 1905. 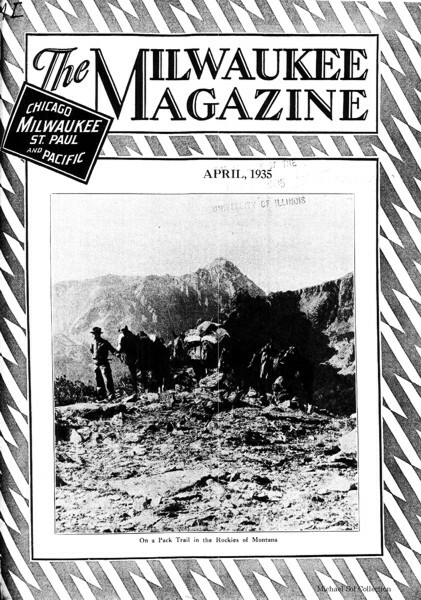 Arthur M. Borak, The Chicago, Milwaukee and St. Paul Railroad: Recent History of the Last Transcontinental," Journal of Business and Economic History, November, 1930. 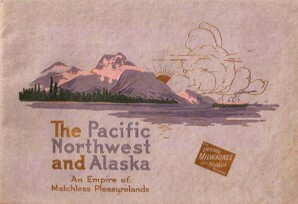 The 1927 Advertising Campaign, added "The Inland Empire," "the Dakotas," and "Missouri"
Electric Railway Journal, "Coast Division Electrified," March 13, 1920. The Miracle of "White Coal"
Look What's Happened to Piggy Back Service! September 1972 Train Performance Study, Harlowton to Tacoma, all trains. 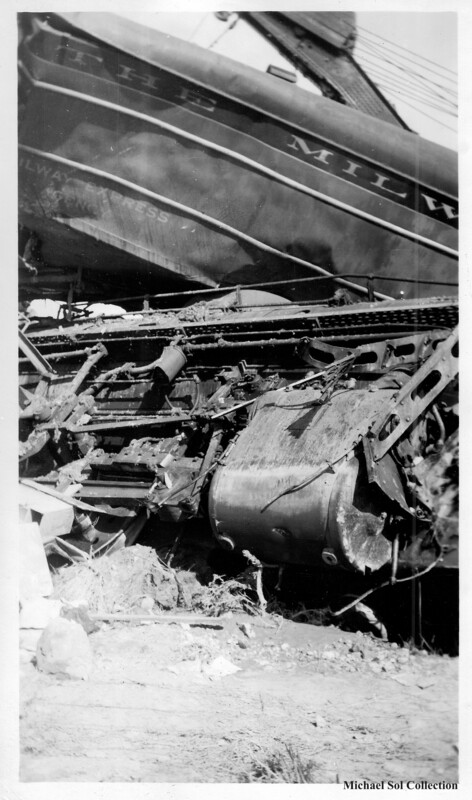 Hamilton Photographs, Wrecks, Volume II, photos 63-79 added; end of Hamilton photographs. 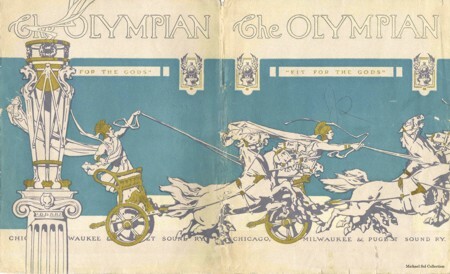 1910, Annual Report, The Chicago, Milwaukee & Puget Sound Co.
1911, Annual Report, The Chicago, Milwaukee & Puget Sound Co.
Railway Age, "Extensive Electrification on the St. Paul," 1914, 57:25. 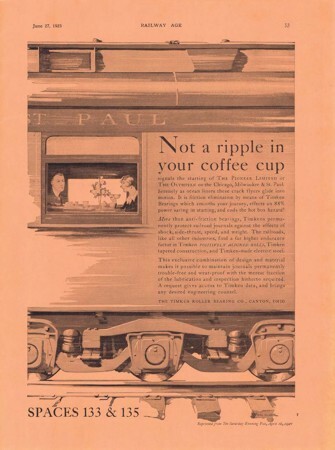 Electric Railway Journal, "New Passenger Locomotive for the St. Paul," February 2, 1918. New York Times, "Electric Link in St. Paul Extension," September 28, 1907. 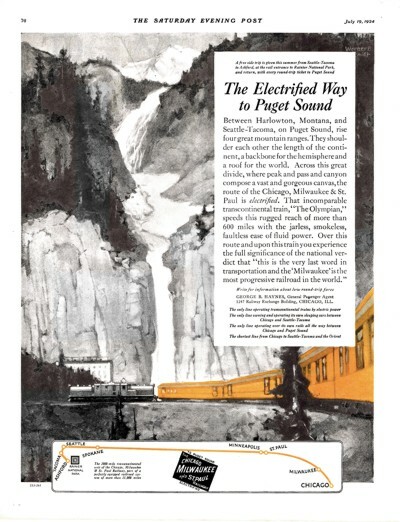 New York Times, "Electric Trains Over the Mountains," April 23, 1916. John Walker Harrington, "Plan to Electrify All American Railroads," New York Times, August 18, 1918. New York Times, "Water Power to Aid Railroad Growth," June 12, 1922. 1912-1913 CM&SP Board of Dir. Exec. 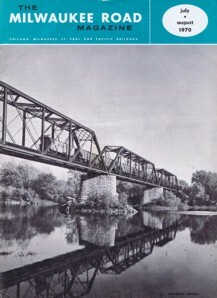 Co.
Gordon W. Rogers, "Where Electrification First Made Good," Trains, July, 1963. BA&P. Electric Railway Journal, "Equipment for St. Paul's New Electrified Division," July 21, 1917. George Gibbs, "Cost of Electric Operation of Steam Railways," Engineering News, March 31, 1910. F.G. Moorhead, "The Foreign Invasion of the Northwest," World's Work, April, 1908. Electric Railway Journal, "The St. Paul Locomotive Tests," December 18, 1915. Electric Railway Journal, "Substation Equipment for the St. Paul's New Electrification," June 21, 1918. 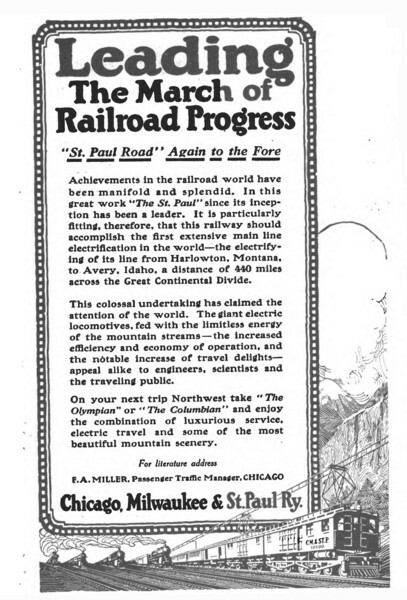 Railway Age, "Formal Opening of the St. Paul Electrification," January 7, 1916. Hamilton Photographs -- Trips on the C.M.&St.P. photos 25-45 added (completed). 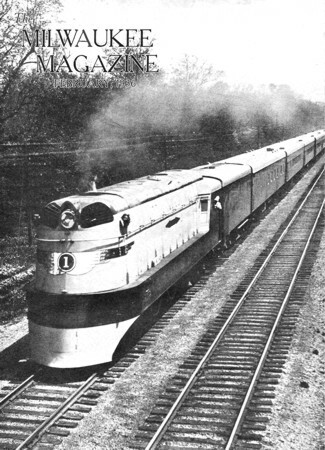 Thomas R. Cook, "The Economic Life of Locomotives and Its Relation to Locomotive Performance and Operating Expense," Baldwin Locomotives Magazine, January, 1934. 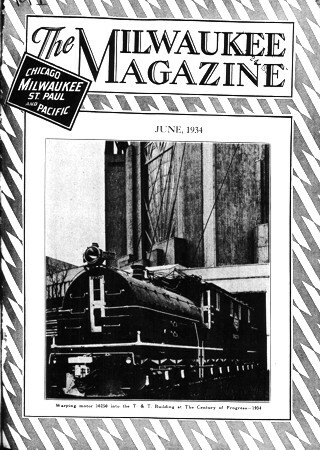 Railway Age, "Milwaukee Buys Steam Locomotives for Fast Schedule," May, 1935. 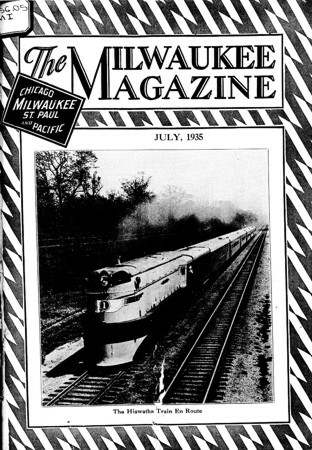 Railway Mechanical Engineer, "Milwaukee Streamlined High Speed Locomotives," June, 1935. Railway Mechanical Engineer, "Distinctive Design Features 4-6-4 Type: Milwaukee Road," November, 1938. 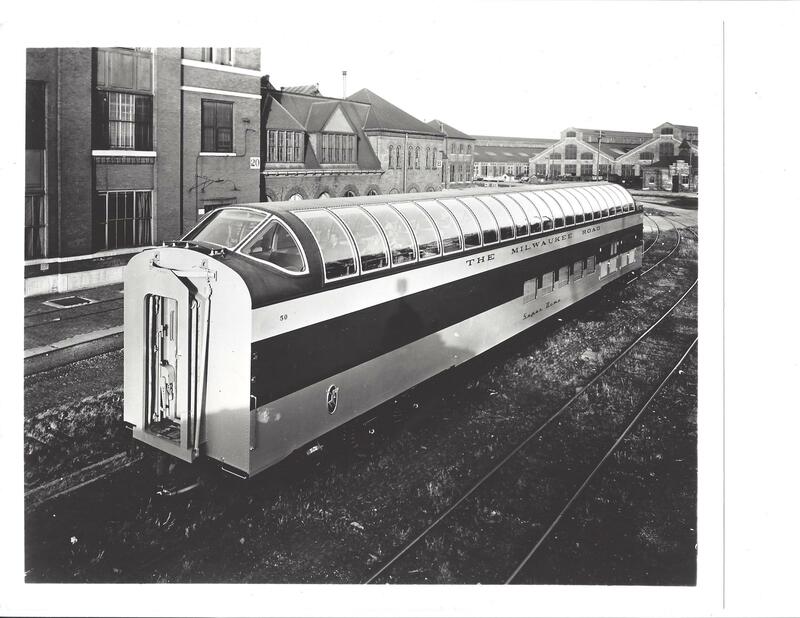 Railway Age, "Milwaukee Installs Six Streamline Passenger Locomotives, September 24, 1938. W.F. 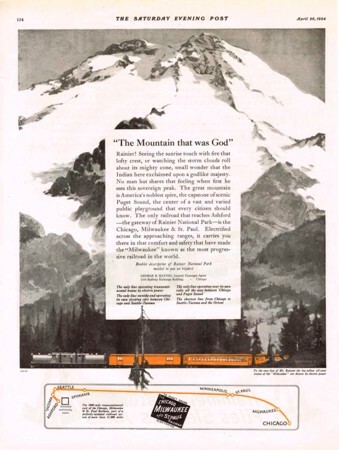 Coors, "Regenerative Braking on the Locomotives of the C.M.&St.P. Ry," General Electric Review, June, 1918. E.W. Rice, Jr., "Railway Electrification as a Means of Saving Fuel and Relieving Freight Congestion," General Electric Review, March, 1918. J.J. Linebaugh and J.L. Burnham, "Protection from Flashing for Direct-current Apparatus," General Electric Review, July, 1918. C.H. Hill, "High Speed Circuit Breakers for the Chicago, Milwaukee & St. Paul Electrification," General Electric Review, September, 1918. John Liston, "Some Developments in the Electrical Industry in 1917," General Electric Review, January, 1918. .L.W. Webb, "Auxiliary Equipment of the Chicago, Milwaukee & St. Paul Locomotives," General Electric Review, November, 1916. J.J. Linebaugh, "Regenerative Electric Braking," General Electric Review," General Electric Review, November, 1916. J.G. Barry, "Commercial Aspects of Electrification of Steam Roads," General Electric Review, November, 1916. A. Smith, "Substations of the Chicago, Milwaukee & St. Paul Railway Electrification," General Electric Review, November, 1916. R. Stearns, "The Control Equipment, with Regenerative Braking Feature, on the Locomotives of the Chicago, Milwaukee & St. Paul Railway," General Electric Review, November, 1916. W.B. 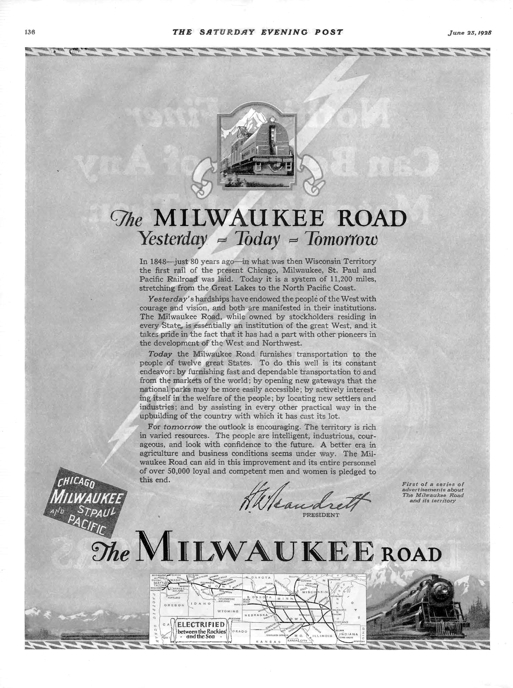 Potter, "The Milwaukee Electrification," General Electric Review, November, 1916. W.S.H. Hamilton, "The Operation of Locomotives in Service on the Chicago, Milwaukee & St. Paul Railway," General Electric Review, November, 1916. 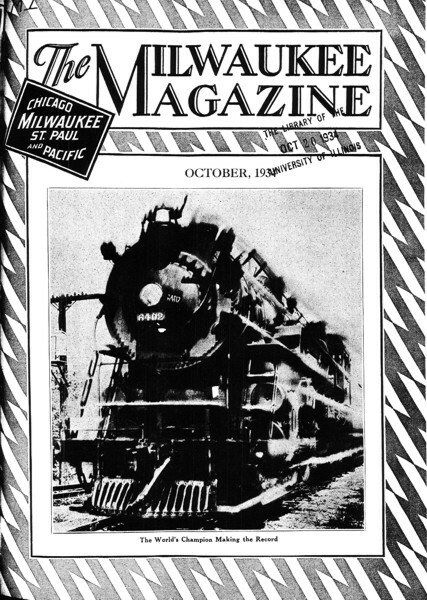 Special Issue, General Electric Review, Milwaukee Road Electrification, November, 1916. J.W. Upp, "High Tension Switching Equipment," General Electric Review, November, 1916. William J. Clark, "Some Aspects of Electrification Finance," General Electric Review, November, 1916. G.H. Hill, "Progress of High Voltage Direct Current Railways," General Electric Review, November, 1916. Hamilton Photographs -- Rotary photos 80-88 added (completed). Hamilton Photographs -- Scenery photos 4-18 added. Hamilton Photographs -- Rotary photos 75-79 added. 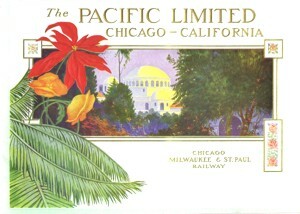 In re CHICAGO, MILWAUKEE, ST. PAUL AND PACIFIC RAILROAD COMPANY, Debtor. 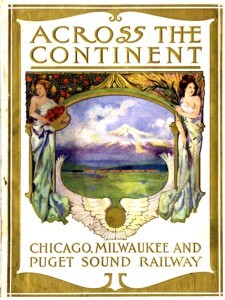 Consolidated joint appeals of: CHICAGO, MILWAUKEE, ST. PAUL AND PACIFIC RAILROAD COMPANY, as Debtor, and Chicago Milwaukee Corporation, as Shareholder. 2/16/1983. 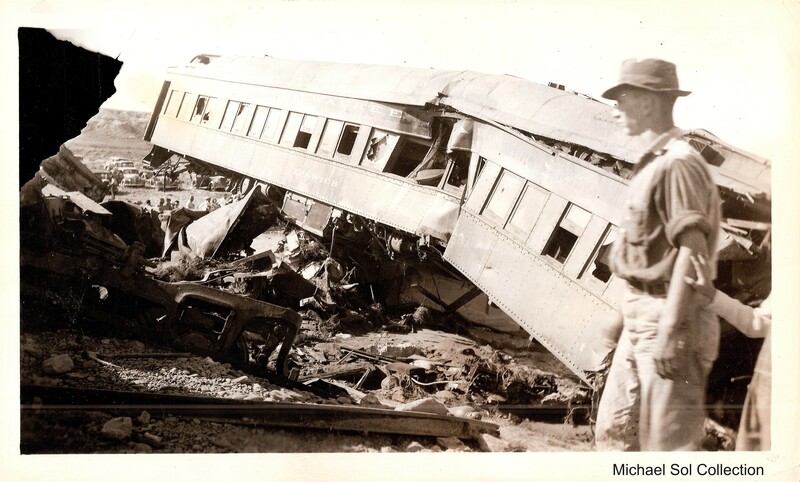 In the Matter of CHICAGO, MILWAUKEE, ST. PAUL AND PACIFIC RAILROAD COMPANY, Debtor. 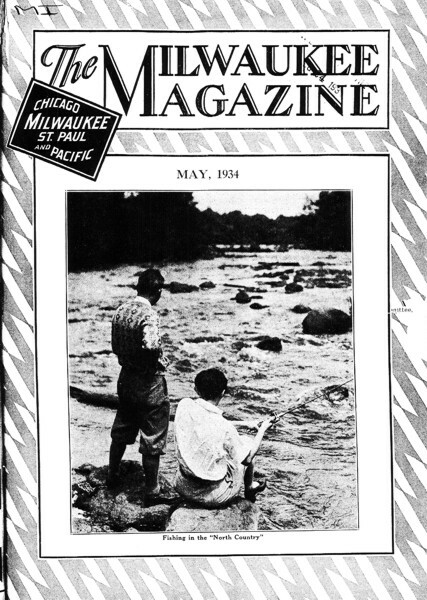 Appeals of CHICAGO, MILWAUKEE, ST. PAUL AND PACIFIC RAILROAD COMPANY, Chicago Milwaukee Corporation, and Chicago, Milwaukee, St. Paul and Pacific Railroad Bond and Debenture Holders Protective Committee, (1986) 791 F2d 524. W.D. 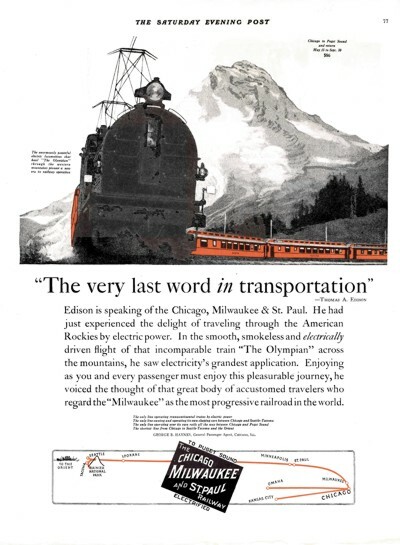 Bearce, "The Electrification of the Mountain District of the Chicago, Milwaukee & St. Paul Railway," General Electric Review, November, 1916. A.F. Batchelder, "The Mechanical Features of the Locomotives of the Chicago, Milwaukee & St. Paul Main Line Service," General Electric Review, November, 1916. E.D. Priest, "The Motor Used on the 300-ton Locomotives of the Chicago, Milwaukee & St. Paul Railway," General Electric Review, November, 1916. R. Stearns, "The Control Equipment, with Regenerative Electric Braking Feature, on the Locomotives of the Chicago, Milwaukee & St. Paul Railway," General Electric Review, November, 1916. Hamilton Photographs -- Rotary photos 67-74 added. Hamilton Photographs -- Scenery photos 0-3 added. John D. Ryan, "The Montana Power Company and Its Part in the Electrification of Railways," General Electric Review, November, 1916. George P. Roux, "Electric Power Transmission Economics," General Electric Review, November, 1916. C.A. 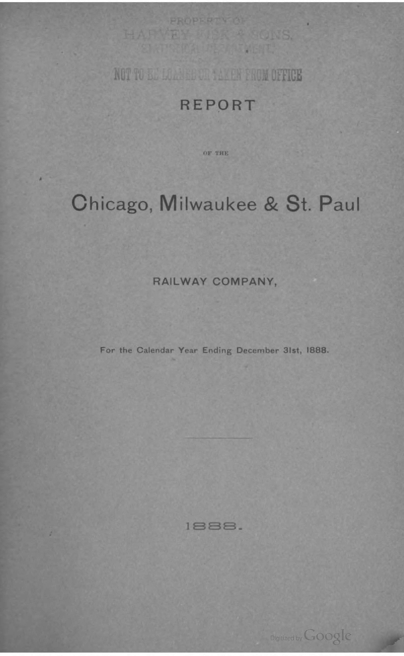 Goodnow, "Some Practical Results Obtained by Electrification on the Chicago, Milwaukee & St. Paul Railway," General Electric Review, November, 1916. L.C. Josephs, Jr., "Electric Switching Locomotives for the Chicago, Milwaukee & St. Paul Railway," General Electric Review, November, 1916. Hamilton Photographs -- Rotary photos 65-66 added. Hamilton Photographs -- Rotary photos 56-64 added. Hamilton Photographs -- Rotary photos 42-55 added. Hamilton Photographs, Rotaries, photos 34-41. E.S. Johnson, "An Epoch-making Railway Electrification," Journal of the Cleveland Engineering Society, July, 1916. Don Sims, "The Terminal at Avery," Model Railroader, 1973. H.R. Morgan, "Report of Diesel Booster Test with EF-5," October 31, 1960. F.G. Moorhead, "Crossing the Great Divide by Electricity," World's Work, April, 1908. E.S. Johnson, "Electrification of the Coast and Cascade Divisions of the C.M.&St.P.Ry.," General Electric Review, April, 1920. "Welcome to the Milwaukee Road"
American Railway Engineering Association, Committee Report on Electrification, March, 1919. Shows total power consumption of various electrification projects. H.H. Cochrane, "Water Power Resources of Montana," General Electric Review, October, 1922. W.D. Bierce, Netherlands Railway Electrification Commission Report, General Electric Review, May, 1922 -- reasons for choosing 1500 v DC. S.T. Dodd, "Electrification of Mainline Railroads," General Electric Review, July, 1922. W.J. 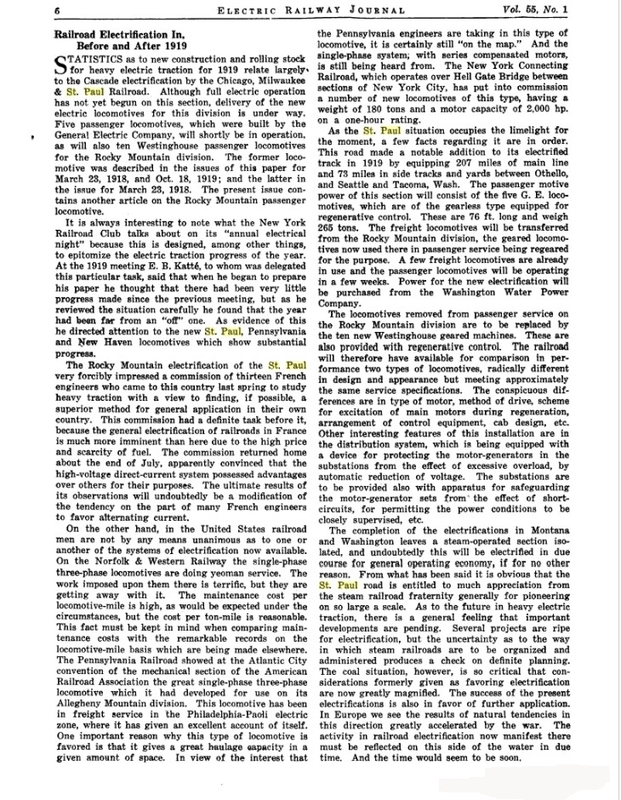 Davis, Jr, "Some Arguments for Railroad Electrification," General Electric Review, December, 1922. 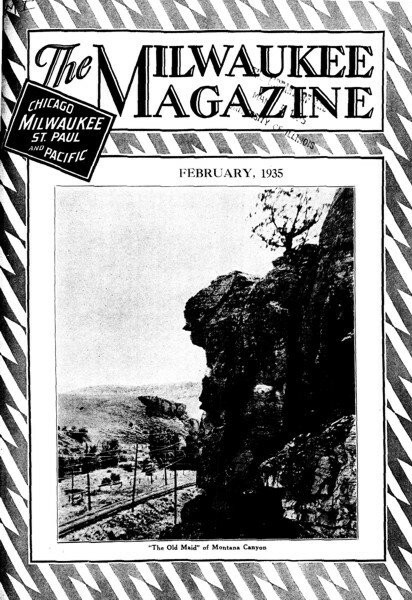 Railway Age, "Chicago, Milwaukee & St. Paul Mountain Line Electrification," January 2, 1914, "to be at 2400 volts." 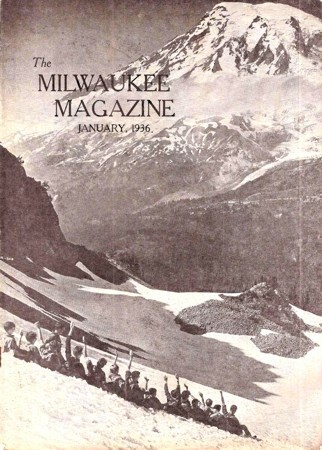 FRA staff paper: A Review of Booz-Allen & Hamilton's "Milwaukee Road Strategic Planning Studies"
Senator Warren Magnuson, Letter to G. Rogers, January 18, 1974, "Unlikely that Milwaukee Road could qualify for any allocation of fuel oil to replace electrical operation ..."
F.H. Craton and H.W. Pinkerton, "Operation of 3,000-volt Locomotives of the Cleveland Union Terminal" presented at A.I.E.E. convention, New York City, January 23-27, 1933. J.J. Linebaugh, "Power-Limiting and Indicating System of the C.M. & St.P. Rwy.," General Electric Review, April, 1920. 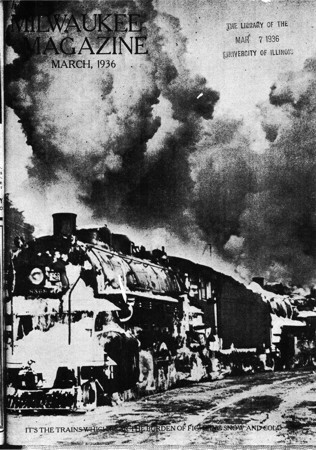 Michael Bezilla, "Steam Railroad Electrification in America, 1920-1950, The Unrealized Potential," The Public Historian, 4:1, Winter, 1982. Myles E. Robinson, "The Evolution of Steam Railroad Electrification," The Journal of Land and Public Utility Economics, 8:2, May, 1932. 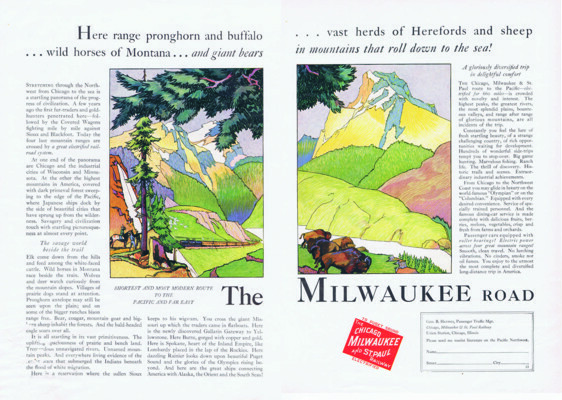 Milwaukee Road Annual Reports, 1942, 1943. A.H. Armstrong, "Last Stand of the Reciprocating Steam Engine," General Electric Review, April, 1920. A. Mauduit, "Summary of French Mission's Report on Railway Electrification," General Electric Review, April, 1920. Creative Crews Ads: "Solving Moving Day Problems," and "Keeping Candy Fresh 'n Handy"
Scientific American, "The Extension of the Chicago, Milwaukee & St. Paul Railway to the Pacific Coast," February 20, 1909, p. 151. 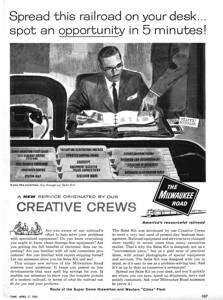 "Creative Crews" ad: Now King-Sized Loads Needn't Duck Their Heads for Tunnels! "Muzzle Not the Ox that Treadeth Out the Corn"
"Electrification of 440.5 Miles of the St. Paul," Railway Age, October 15, 1915. 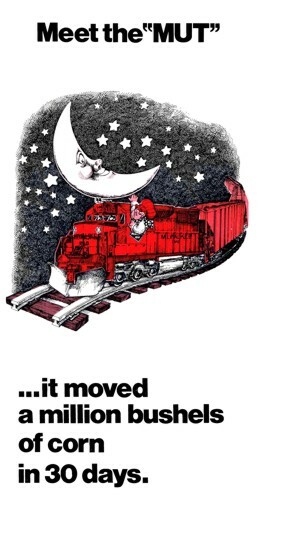 "More Trailers Than Ever are Taking the Train," Advertisements, Railway Age, September 30, 1968. 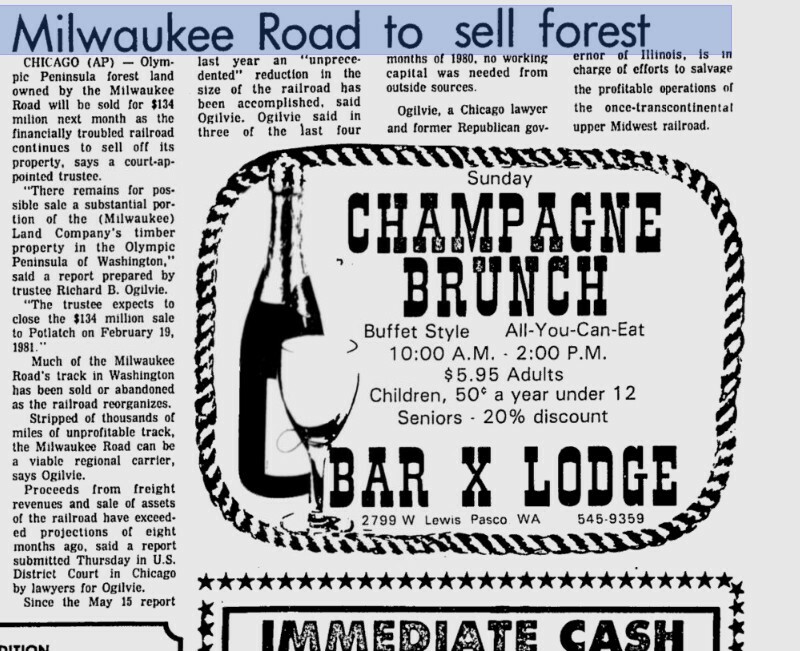 "Farewell, Little Joes," The Missoulian, October 21, 1973. 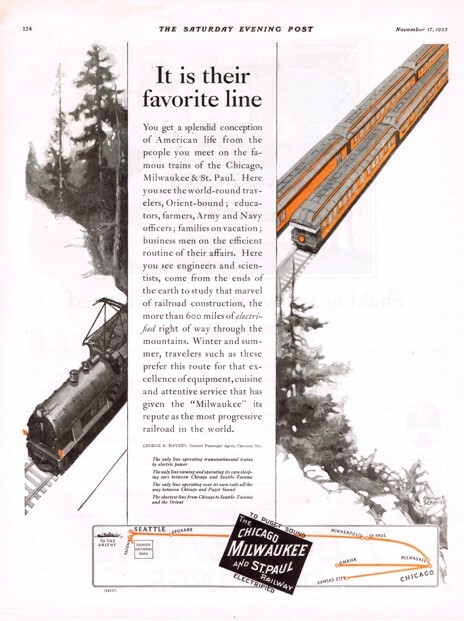 Senate Hearings on Railroad Holding Companies, Milwaukee Road: December 6, 7, 8 and 9 Sessions, 1937. "King of the Rails," September 20, 1917, CM&St.P. New York Times, July 13, 1913, "Railroads Plan Electrification for Big Distances." 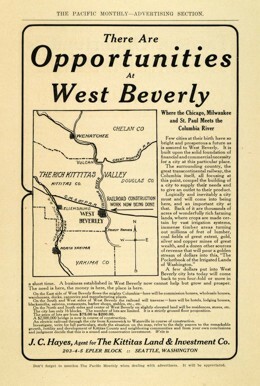 Westinghouse Electric Co., "Westinghouse Railroad Data," June, 1924. New York Times, "Puget Sound Pays Dividend," February 25, 1911. New York Times, "Puget Sound Payings its Way," December 9, 1909. "Operation of the St. Paul Electrification," Railway Age, July 7, 1916. 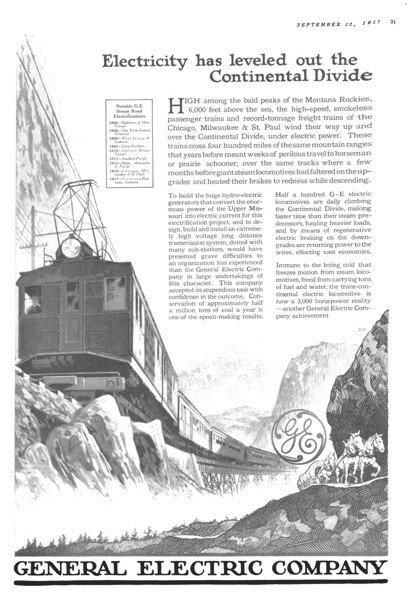 General Electric Advertisement, "Twenty-one Years of Electrification," Railway Age, July 21, 1916. Railway Age, "The Great Northern Compared to Other Roads," August 8, 1925 "Has been unable to overcome effects of low rates and slow increase in traffic ...". Personal Notes on "The Investor Pays"